Celebrate YOU today! You are the person that puts paper, embellishments, and adhesive together to create beautiful pages together for your family's memory books. I so enjoy learning from and visiting all of you! You inspire me to be a better paper crafter and to make this not just a hobby and business, but something that is terribly important for my son and all the family that is to come. 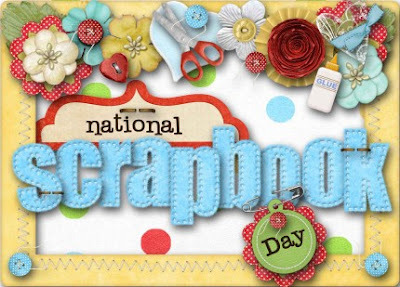 So I hope you have time today to sit down with all your wonderful supplies, make a page, and celebrate why you are a paper crafter. I am heading over to a local Senior Center today and spending my day with 24 wonderful customers at my 12-hour crop. Vendors are coming in, there are tons of great prizes, and plenty of good food. I love that I am spending the day with people that love scrapbooking as much as I do! I hope you have a great day! If you need a good sale for supplies, head over to my website and take a peek at the While Supplies Last items. Add you order to the Mystery Hostess Gathering, and you could qualify to win the hostess rewards for the online Gathering I set up in honor of this day!